- Blocks out contaminants like bacteria, parasites, viruses as the water enters. It is efficient and does not remove all natural minerals such as calcium and magnesium. The service life of the hollow-fiber filter is 1~3 years. Not waste filter cartridges. Self-flushing system reduces operating and maintenance costs. Compact unit can be easily added to any existing automated watering system. Ultra filter can satisfy whole family’s consumption of drinking, washing and cooking. are 0.02 micron. 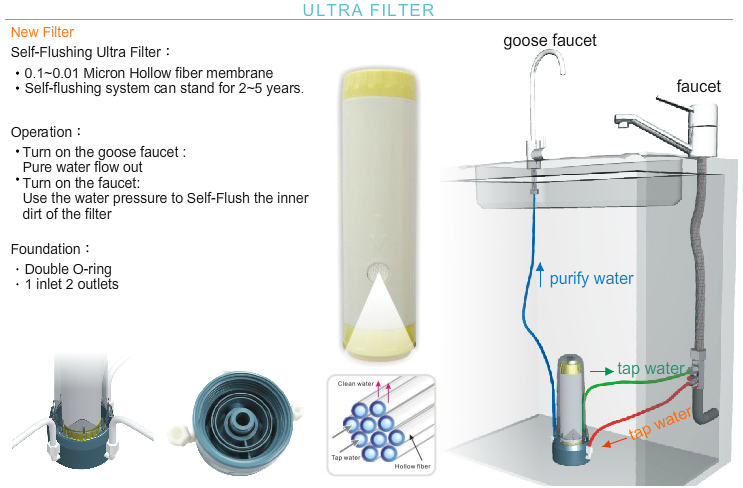 Ultra filter can claim major anti-bacteria properties.